Boston Baby Mama: I'm a Mom?!?!?! 13 years of birth control pills: Thousands of wasted* dollars! Multiple fertility medications: Many Benjamins! Multiple fertility treatments (IUI & IVF): MUCHO bucks! A year of therapy to deal with my infertility: Best thing insurance ever paid for! A new maternity wardrobe: Way too much money! *I say wasted because I later found out I can't get pregnant on my own anyhoo!! On December 4th, at 2:11 AM I gave birth to my beautiful daughter, Marlo Ada. She decided to grace us with her presence 4 weeks and 2 days before her due date, and weighed in at 5 pounds 6 ounces. After a quick visit to the NICU to get her lungs checked out, she was able to room with us for the remainder of our stay at Brigham & Women's hospital. Now at 11 days old, she is thriving, and we are loving every minute of being parents. I have so much to share with everyone, so keep a look out for the following posts (having trouble finding the time to finish writing them all, believe it or not :)! I look forward to reading your upcoming posts. I too thought that my lactation consultant was the best money ever spent. Too bad for me that it was 4 weeks after breastfeeding and having thrush (which I thought was "normal breastfeeding pain")that I saw her. 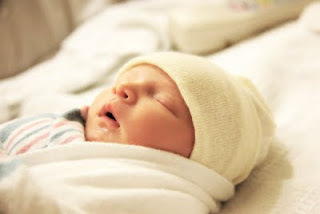 Even though they say "sleep when your baby sleeps", I was so anxious that I could hardly sleep at all. Every breath the baby made I was all ears. It took a good three to four weeks before I could relax! =) Enjoy each precious moment! Congrats!